A common rock-forming mineral of dark-colored igneous rocks. Augite: A specimen of the "jeffersonite" variety of augite. Approximately 11 x 6.3 x 4.3 centimeters in size. From the Franklin Mining District of Sussex County, New Jersey. Specimen and photo by Arkenstone / www.iRocks.com. Igneous rock composition chart: This chart illustrates the generalized mineral composition of igneous rocks. Augite, as the most abundant pyroxene mineral, can play an important role in the composition of gabbro, basalt, diorite, and andesite. Augite is a rock-forming mineral that commonly occurs in mafic and intermediate igneous rocks such as basalt, gabbro, andesite, and diorite. It is found in these rocks throughout the world, wherever they occur. Augite is also found in ultramafic rocks and in some metamorphic rocks that form under high temperatures. Augite has a chemical composition of (Ca,Na)(Mg,Fe,Al)(Si,Al)2O6 with many paths of solid solution. 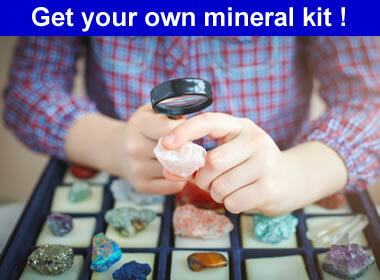 Commonly associated minerals include orthoclase, plagioclase, olivine, and hornblende. 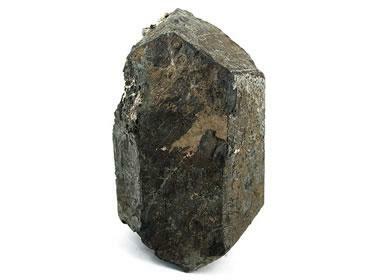 Augite is the most common pyroxene mineral and a member of the clinopyroxene group. Some people use the names "augite" and "pyroxene" interchangeably, but this usage is strongly discouraged. There are a large number of pyroxene minerals, many of which are distinctly different and easy to identify. Augite, diopside, jadeite, spodumene, and hypersthene are just a few of the distinctly different pyroxene minerals. Streak White to gray to very pale green. Augite is often brittle, breaking into splintery fragments on the streak plate. These can be observed with a hand lens. Rubbing the debris with a finger produces a gritty feel with a fine white powder beneath. Luster Vitreous on cleavage and crystal faces. Dull on other surfaces. Diaphaneity Usually translucent to opaque. Rarely transparent. Cleavage Prismatic in two directions that intersect at slightly less than 90 degrees. Diagnostic Properties Two cleavage directions intersecting at slightly less than 90 degrees. Green to black color. Specific gravity. Chemical Composition A complex silicate. Uses No significant commercial use. Augite is usually green, black, or brown in color with a translucent to opaque diaphaneity. It usually exhibits two distinct cleavage directions that intersect at slightly less than 90 degrees. A hand lens is often needed to properly observe the cleavage, especially in fine-grained rocks. Light reflecting from cleavage surfaces and crystal faces of augite produces a vitreous luster, while light striking other surfaces produces a dull luster. Augite has a Mohs hardness of 5.5 to 6. Its specific gravity of 3.2 to 3.6 is higher than most other minerals in the rocks in which it occurs. Augite: A specimen of the "fassaite" variety of augite. Approximately 5 x 3.1 x 1.4 centimeters in size. From the Skardu District of Pakistan. Specimen and photo by Arkenstone / www.iRocks.com. 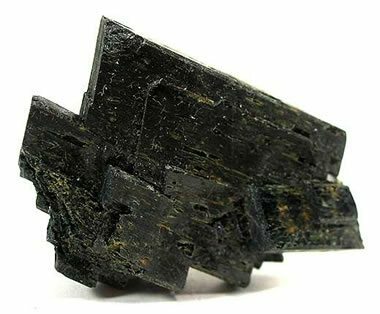 Augite does not have any physical, optical, or chemical properties that make it especially useful. It is therefore one of the few minerals that has no commercial use. The calcium content of augite has been found to be of limited use in studies of the temperature history of igneous rocks. Augite is a mineral that has been found beyond Earth. It is a common mineral of lunar basalts. It has also been identified in many stone meteorites. Some of these meteorites are thought to be pieces of Mars or the Moon that were launched into space by large impact events.